The Doppler lidar (DL) is an active remote-sensing instrument that provides range- and time-resolved measurements of the line-of-sight component of air velocity (i.e., radial velocity) and attenuated aerosol backscatter. The DL operates in the near-infrared and is sensitive to backscatter from atmospheric aerosol, which are assumed to be ideal tracers of atmospheric wind fields. The DL works by transmitting short pulses of infrared laser light into the atmosphere. 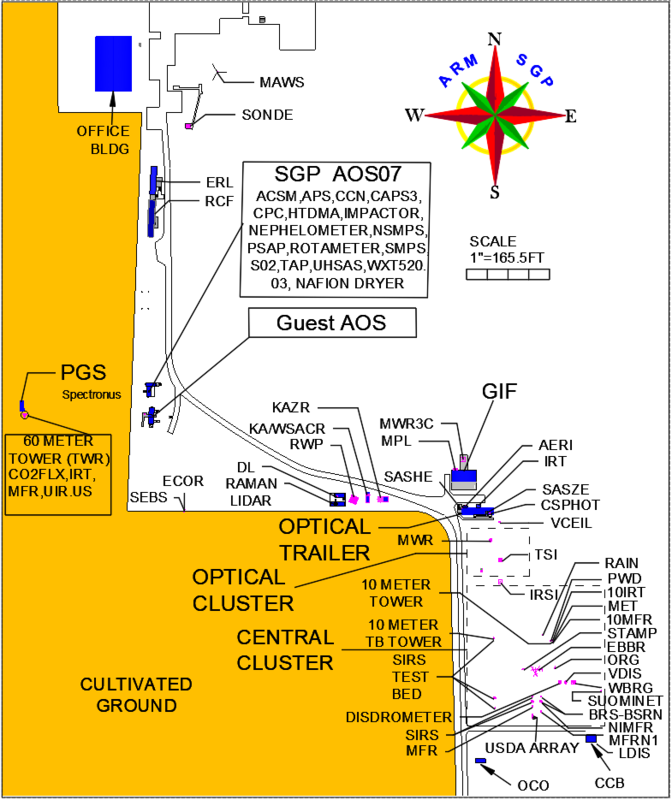 Atmospheric aerosols scatter a small fraction of that light energy back to the transceiver, where it is collected and recorded as a time-resolved signal. From the delay between the outgoing pulse and the backscattered signal, the instrument infers the distance to the scattering volume. Coherent detection is used to measure the Doppler frequency shift of the backscatter signal. This is accomplished by mixing the backscatter signal with a reference laser beam (i.e., local oscillator) of known frequency. The onboard signal processor then determines the Doppler frequency shift from the spectrum of the mixed signal. The Doppler frequency shift and thus the radial air velocity is determined from the peak of the Doppler spectrum. The attenuated backscatter is determined from the energy content of the Doppler spectra. The DL provides accurate measurements of radial velocity in regions of the atmosphere where aerosol concentrations are high enough to ensure good signal-to-noise ratio. Thus, valid data are usually limited to the atmospheric boundary layer where aerosol is ubiquitous. Valid measurements can also be obtained in elevated aerosol layers or in optically thin clouds above the boundary layer. Most of the ARM DLs have full upper-hemispheric scanning capability, enabling 3D mapping of turbulent flows in the atmospheric boundary layer. With the scanner pointed vertically, the DL provides height- and time-resolved measurements of vertical velocity. Coniglio M, G Romine, D Turner, and R Torn. 2019. "Impacts of Targeted AERI and Doppler Lidar Wind Retrievals on Short-Term Forecasts of the Initiation and Early Evolution of Thunderstorms." Monthly Weather Review, 147(4), 10.1175/MWR-D-18-0351.1. Tjernström M, M Shupe, I Brooks, P Achtert, J Prytherch, and J Sedlar. 2019. "Arctic Summer Airmass Transformation, Surface Inversions, and the Surface Energy Budget." Journal of Climate, 32(3), 10.1175/JCLI-D-18-0216.1. Shukla K, D Phanikumar, R Newsom, N Ojha, K NiranjanKumar, N Singh, S Sharma, V Kotamarthi, and K Kumar. 2019. "Investigations of vertical wind variations at a mountain top in the Himalaya using Doppler Lidar observations and model simulations." Journal of Atmospheric and Solar-Terrestrial Physics, 183, 10.1016/j.jastp.2018.12.011. Wagner T, P Klein, and D Turner. 2019. "A new generation of ground-based mobile platforms for active and passive profiling of the boundary layer." Bulletin of the American Meteorological Society, 100(1), 10.1175/BAMS-D-17-0165.1. Fast J, L Berg, L Alexander, D Bell, E D’Ambro, J Hubbe, C Kuang, J Liu, C Long, A Matthews, F Mei, R Newsom, M Pekour, T Pinterich, B Schmid, S Schobesberger, J Shilling, J Smith, S Springston, K Suski, J Thornton, J Tomlinson, J Wang, H Xiao, and A Zelenyuk. 2018. "Overview of the HI-SCALE Field Campaign: A New Perspective on Shallow Convective Clouds." Bulletin of the American Meteorological Society, , 10.1175/BAMS-D-18-0030.1. ONLINE. Koch S, M Fengler, P Chilson, K Elmore, B Argrow, D Andra, and T Lindley. 2018. "On the Use of Unmanned Aircraft for Sampling Mesoscale Phenomena in the Preconvective Boundary Layer." Journal of Atmospheric and Oceanic Technology, 35(11), 10.1175/JTECH-D-18-0101.1. Stith J, D Baumgardner, J Haggerty, R Hardesty, W Lee, D Lenschow, P Pilewskie, P Smith, M Steiner, and H Vömel. 2018. "100 Years of Progress in Atmospheric Observing Systems." Meteorological Monographs, 59, 10.1175/AMSMONOGRAPHS-D-18-0006.1. Johnson A, X Wang, K Haghi, and D Parsons. 2018. "Evaluation of Forecasts of a Convectively Generated Bore Using an Intensively Observed Case Study from PECAN." Monthly Weather Review, 146(9), 10.1175/MWR-D-18-0059.1. Zhang D, A Vogelmann, P Kollias, R Oktem, D Romps, and M Jensen. 2018. Southern Great Plains (SGP) Three-Dimensional Observations of Fair-Weather Cumuli Field Campaign Report. Ed. by Robert Stafford, ARM user facility. DOE/SC-ARM-18-026.